By Charlotte Kells, Executive Coach, Kells Associates. Joe came to me for coaching because he received feedback that he needed to build his leadership presence. Unfortunately, he didn’t know what that meant. His boss wanted him to build his confidence around his own abilities and have others see him ready to move into a key role in his growing company. His boss wanted people to experience Joe’s “leadership presence.” Joe needed some clarity on what his boss was really looking for. Also, he was unsure of how others really saw him as a leader. John Baldoni, in his book, Lead Your Boss, The Subtle Art of Managing Up, defines leadership presence as “earned authority.” He explains that first a leader must earn the respect and trust of coworkers. Leadership Presence is a fundamental competence and is essential for inspiring and motivating others. It is more than just charisma. Charisma can add to presence, but leadership presence is developed over time, when people feel deeply connected and engaged with the leader. Our brand is determined by our intentions and mindsets, our energy, our abilities, and our behaviors. It can impact how we communicate with others, influence, collaborate, etc. It impacts all aspects of leadership. Having a strong leadership presence is one part of our brand and an extremely important one. People say they feel trust and respect and want to engage, interact with us. They are willing and motivated to let us lead! What is our Brand Relative to Leadership Presence? The process of developing our leadership presence starts with understanding our leadership brand. First of all, what are our own values, standards, and personal mission for our leadership? What is our core energy? How do we align with that energy? What are our intentions and expectations of others? Next, we need to ask, what is our impact with all of that on others? What are people’s perceptions of us as leaders? How do they experience our energy? How do they see us communicating and engaging others in / through change? What level of trust and motivation do they experience when they are in our presence? Regardless of our own intentions, it is the perceptions and experience of others which can help us determine our true leadership brand. As mentioned above, the first step in developing our leadership presence is to be mindful and self-aware of how we “show up” to others around us. The best way to learn others perceptions, wants and needs is to ask them! We can do this through one-on-one conversations, third party interviews, or conducting a formal 360 assessment process. It is important that the 360 tool is based on quantitative data that measures the person’s leadership competencies in comparison to a significant data base of successful leaders. It is also important that the 360 instrument measures a person’s energetic connection to others, their empathy, their passion, their ability to inspire, and their ability for authentic self-expression. As we discussed, these are the qualities that define leadership presence. Also, there must be opportunity for feedback providers to offer qualitative data – open-ended questions that allow stakeholders to offer suggestions. Everyone involved in the process must have the understanding that the final report is kept totally confidential and will be used only for development purposes. It should be administered and debriefed by a neutral third party in a non-judgmental, safe coaching environment. Which leadership behaviors are well received and which are unproductive? What do my stakeholders want and need from me? How can I communicate more authentically with them? What do they need to feel motivated and inspired? How can I connect energetically with them? Energy – What “energy” am I projecting? What impact do I want to make energetically on others? Mindsets – What are my beliefs about myself, others, and the world? What assumptions might I be making? What are my intentions? How do I want others to experience my attitudes? Competencies – What knowledge, skills, and behaviors do I need to connect, motivate, and inspire others? What are 2-3 goals for creating my brand? What steps might I take to make those happen? What impact with this action make on my stakeholders? When will the specific action steps be complete? The Responsibility Mindset – I am responsible for my thoughts, feelings, and actions. No person, place, or situation is the cause of my experience. Conscious Choice Mindset – I get to “choose” how I want to experience a given situation. I am empowered to act from that place of choice. Positive View of Others – I trust / assume that everyone is simply doing their best. I may not agree with their choices and actions, but I choose to trust that their intentions are to do their best in the given situation. Use of inquiry – Instead of the “tell and sell” approach to leadership, we use more inquiry to elicit stakeholder input. what is important to them at any given moment. Listen to learn – Using “active listening” to ensure we heard what people are really saying. What are the thoughts and feelings behind their words? Mutual problem solving – Instead of being “the expert” or the one who has to have all the answers, we believe others can offer valuable ideas and solutions to problems. We use the question, “In what ways might we resolve this . . .?” to allow stakeholders to participate in the planning and problem solving process for win-win solutions and mutual alignment on goals. Passion– Demonstrating a good deal of energy, intensity, and authentic expression to keep others engaged and enthused. Our leadership brand is how we are seen / experienced by the world. We have an opportunity to determine and shape our brand to demonstrate our strong leadership presence. We do so by first understanding how our stakeholders perceive us. From that information, we listen and learn what is working and what is not. We learn what our stakeholders need from us to be motivated and inspired. Then, we envision what we want our brand to be. What mindsets and behaviors will help us develop a personal brand that demonstrates? From there, we develop an action / learning plan to make it happen. Of course, we need to continually be mindful and self-aware of what we are doing and how we are perceived. We do that by revisiting a 360 assessment process and having an ongoing, open feedback loop with our stakeholders. By taking these steps, we ensure that our leadership presence is not only how we are perceived by others, but who they really know us to be! Baldoni, John. 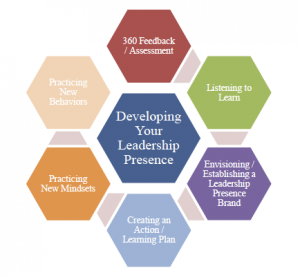 Developing Your Leadership Presence. Harvard Business Review Blog Network. October, 2009. Halpern, Belle Linda and Kathy Lubar. Leadership Presence. Gotham Books. 2004. Hedges, Kristi. The Power of Presence. AMACOM. 2012. Hodgkinson, Susan. The Leader’s Edge, Using Personal Branding to Drive Performance and Profit. iUniverse, Inc. 2005. McLaughlin, Jerry. The Power of Brand Building. www.forbes.com. December, 2011. Charlotte Kells is an Organizational Effectiveness Consultant and Executive Coach. She is Founder of Kells Associates, www. kellsassociates.com. She can be contacted at ckells@kellsassociates.com.